Ever get the feeling your users aren’t that happy with your project? We all get those issues that are real downers on our repository. So I thought, let’s take these issues and make something fun. Using the Text Analytics Service and the WordCloud Python package, we can make some pretty pictures out of otherwise negative comments. I also found it fun to make clouds of the more positive issues. Below you will find a few snippets on how to do this yourself. If you want to just run this against your favorite GitHub project you can open a Jupyter notebook using the notebook link above. The below code is shown just to give you an idea of what the notebook does. In order to make it function you would need to complete a few additional bits of code. We use a few libraries and should start by installing them. CortanaAnalytics is a small library to wrap requests to Azure Data Market Services. PyGitHub serves a similar purpose for GitHub. 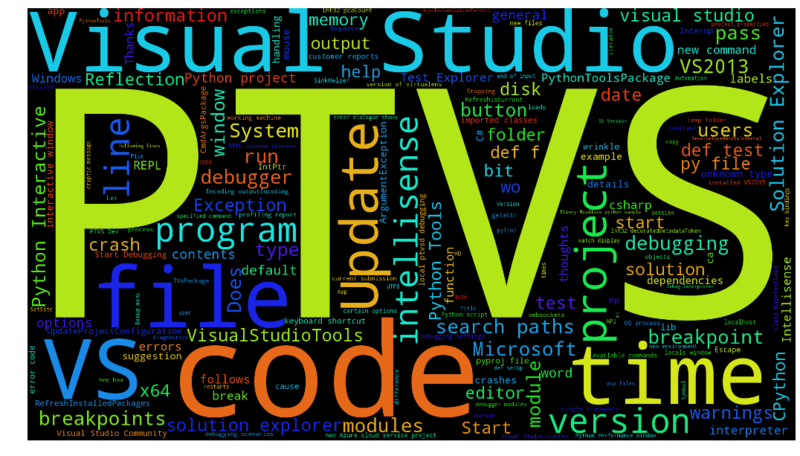 WordCloud helps to make pretty pictures. We need two API keys so we can access some services. You can get a GitHub API Key by creating a token at https://github.com/settings/tokens. Once you have API Keys, you just need to get GitHub issues. Once you have the GitHub issues we can iterate on them arranging them into text bits that can be analysed by Text Analytics. We will batch Sentiment requests together for the issue to cut down on the overall number of requests. We can also get key phrases using the same issues we used for sentiment. And once we have all of that, we can go ahead and make word clouds. And that’s it. You can try to reproduce this on your own locally or run the notebook and experiment from the Azure Notebooks environment.